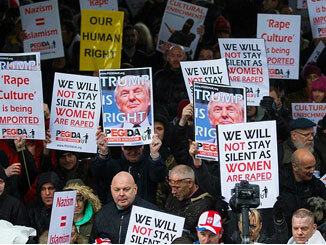 Trump and right wing parties in Italy, Hungary, Austria and Germany are currently at the forefront of campaigns against immigrants. In Europe, the EU’s and Germany’s refugee policies are under concerted attack, with Trump aiding these attacks as he wants to weaken the EU and force Germany to accede to US economic demands. The squeeze on living standards in the West is polarising popular opinion, and the right wing side of that polarisation is being radicalised on issues of racism – against immigrants, Muslims, Black communities and Roma. This radicalisation has echoes of Europe in the 1920s and 30s, when capital was building up far-right parties promoting antisemitism. Then the aim was to install fascist governments in a number of countries. At present that is not the case, it is anti-immigrant far-right populists which are being promoted into governments. In Europe Trump is linked up with the far-right and seeking to destabilise the EU and in particular Germany. A key focus of attack is Merkel and her refugee policy. Weakening Merkel is a priority for Trump as he needs Germany to capitulate to his demands on trade. Trump is looking for significant resources from Germany to help him finance the US’ confrontation with China. Merkel is an obstacle in this as she has been defending the interests of German imperialism against Trump’s demands. Some progress has been made in undermining Merkel. The CDU/CSU vote share at last September’s German elections falling 9 per cent on the previous general election, to 33 per cent, its lowest share since 1949. The far-right AfD vote grew by 8 per cent to reach a 12.6 per cent share. The German government has been dealing with an internal crisis on immigration, which may have been resolved with Merkel’s capitulation, but the issue is likely to keep rearing its head inside the governing coalition. The Bavarian Christian Social Union (CSU) had demanded that Merkel agree to turning away refugees at Germany’s borders and she has agreed to ‘transit centres’ being built at the borders which will stop refugees already registered in the EU from moving into Germany. The CSU-CDU dispute had threatened Merkel’s coalition, that only formed three months ago. It remains to be seen if the SPD will accept this restrictive border policy as they have rejected transit camps in the past. Austria is governed by a coalition formed by the centre-right Austrian People’s Party and the far-right Freedom Party of Austria. The government will be taking over the EU’s rotating Presidency from 1 July and will use this position to harden up the EU’s line against immigration. Austria’s Chancellor Sebastian Kurz says he wants to form an anti-immigration ‘axis’ with the-far-right in Germany and Italy. Kurz has spoken of creating military ‘secure zones’ in North Africa for combating the movement of refugees into Europe. Whilst his colleague, Austria’s Interior Minister, Hertbert Kickl of the Freedom Party of Austria wants to ‘concentrate’ migrants in one far-off place outside of the EU. Austria’s proposal for camps to be built in North Africa as a place to send refugees saved at sea is gaining traction amongst the far and conservative right wing in Europe. The new Italian coalition government, formed last month, comprised of the right wing populist Five Star Movement and the overtly racist and xenophobic League, supports camps in North Africa. It is currently denying ships carrying refugees, who have been rescued from the sea, from docking in Italian ports and is seeking changes to the EU’s policies that accept refugees. The government wants to deport tens of thousands of ‘illegal immigrants’ who have been denied asylum in Italy. The new far-right Interior Minister, Matteo Salvini, also proposes to conduct a ‘census’ of the Roma population in Italy and deport those without Italian nationality. The Italian government has made clear to Germany that it will not accept refugees being sent back to Italy that have already applied for asylum in Italy and it is calling for the EU’s ‘Dublin principle’ to be abolished. The latter is the convention where by asylum seekers are supposed to remain in the first EU state they land in. As elsewhere in Europe the US has been helping the far-right in Italy. Steve Bannon, formerly Trump’s chief strategist, convened a meeting of far-right forces in Rome during the Italian elections. In Hungary on 20 June (International Refugees Day), the Parliament decided to make it a criminal act to help refugees. Lawyers and civil society organisations are even being barred from helping refugees claim asylum or apply for residence. In Britain different sections of capital are temporarily clashing over the promotion of racism, but are in total agreement on trying to stop the election of a Labour government. Two sections of capital are currently taking different approaches to the issue of immigration. Those with economic ties into Europe are pursuing a more pro-immigration line as they try to defend their businesses’ dependence on the Single Market and free movement of labour. Pressure from this quarter has recently forced the Tories to repudiate some of Theresa May’s longstanding reactionary positions on immigration. They will rapidly return to promoting a reinvigorated anti-migrant agenda as soon as their future economic relations with Europe have been decided. Those sections of capital allied to Trump and the US want to step up the anti-migrant offensive to maintain pressure on the Tories not to capitulate on Brexit. Ultimately their aim is to take the leadership of the Tories so the party is firmly allied to the US and Trump and can wage a massive offensive against the working class. They are building up a populist far-right in Britain, drawing together a section of the Tories, with former UKIP supporters, allied to football hooligans and Tommy Robinson. It is organised on a pro-racism, pro-Trump, pro-Brexit basis. Trump’s support for this type of approach was evident when he shared Britain First’s racist tweets last year. Both pro-EU and pro-US sections of capital agree that the electoral priority in Britain is to ensure there is not a Labour government. That means in parliamentary elections votes must be concentrated on parties that can deprive Labour of seats. Under the first past the post electoral system that means right wing votes, including those of the far-right need to go to the Tory party. That is why UKIP has been crushed and capital is not promoting a far-right electoral project. This is different than in the rest of Europe where far-right electoral politics is being built up. Corbyn’s Labour is, in effect, blocking their advance in Britain. So the far-right at present is focussed on street actions, which has coalesced around the ‘Free Tommy Robinson’ campaign which has fascists at its core. This movement’s central London June demonstration was attended by over 15,000 people and it is now mobilising for Saturday 14 July to show its support for Trump when he visits Britain. There will be much expression of opposition to Trump’s visit when he arrives, including the Together Against Trump demo and rally in London on the 13 July. All progressive political forces will want to mobilise for and attend these events. In addition Unite Against Fascism and Stand Up To Racism are organising a ‘Unity protest against the Nazis and Tommy Robinson’ on 14 July to counter the far-right’s mobilisation. Greetings to Pride and UK Black Pride!